"For me painting is a journey of discovery...a process of peeling back the layers of the subconscious in an effort to make sense of the chaos that often surrounds us." Noel Hodnett was born in Gatooma, (Kadoma) Southern Rhodesia (Zimbabwe) and moved to South Africa at an early age. In 1968 Hodnett enrolled at the School of Fine Art at Rhodes University in Grahamstown (Makhanda), South Africa, and graduated with distinctions in painting in 1971. He joined the staff of the Fine Art Department at Rhodes as a Technical Assistant and Ceramics Instructor the following year. In 1975 Hodnett was appointed Head of Photography and in 1985, was appointed Head of Painting and Drawing. 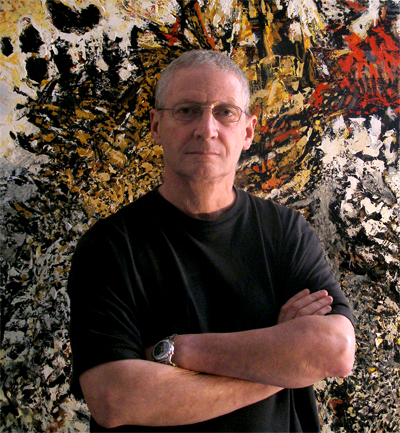 Hodnett held this position until the beginning of 1997 when he chose to leave academia and further his career as a professional artist in the International arena. Noel Hodnett currently lives and works in Vancouver, British Columbia. Hodnett’s early work reflects the various aspects of his Southern African roots. Working predominantly in the Eastern Cape Province in and around the small city of Grahamstown, Hodnett’s deep love of the Albany landscape inspired him to produce large and small-scale works of International acclaim. He exhibited regularly with the 'Grahamstown Group' (1961-1978) founded by Brian Bradshaw, Professor of Fine Art at Rhodes University, and later with GAP (Grahamstown, Alice and Port Elizabeth) as a founder member of that group after the Grahamstown Group disbanded in 1978. Hodnetts work was selected for inclusion in all three Cape Town Triennials (1985, 1988 and 1991) He was also among four artists chosen to represent South Africa at the IX Inter-national Biennial of Art in Valparaiso, Chile, following democratic elections in 1989. In 1992 Noel Hodnett was chosen as ‘Artist in Residence’ at the South African National Festival of the Arts in Grahamstown. He was invited by the governing committee of the prestigious Standard Bank Centre Gallery in Johannesburg to hold a major solo exhibition in November that same year. In 1995 Noel Hodnett was invited to exhibit his work as part of the 1st Johannesburg Africus 95 Biennial in a major solo exhibition at the Everard Read Gallery, Johannesburg, South Africa. In 1997 his work was selected for inclusion in The South African Landscape  Four Points of View exhibition at Art First  Contemporary Art, London, U.K.
Hodnett's well-received "Portraits of the Forgotten" exhibition, featuring portraits of Steve Biko, Stompie Seipei and Masha Bruskina, was held at the Britannia Community Centre Project Gallery in East Vancouver in May 2002. These works now form part of the permanent collection at Simon Fraser University, Burnaby, BC. The artist's first major solo exhibition in North America was held in November 2002 at the Ballard Lederer Gallery in Vancouver, British Columbia. Hodnett was represented by the prestigious Buschlen Mowatt Gallery between 2004 and 2006. In 2007 he opened his own gallery, hfa contemporary, in the developing art district of east Vancouver. In 2007 the Director and Curator of Simon Fraser University Galleries, Bill Jeffries, invited Noel Hodnett to exhibit a series of paintings depicting, among others, victims of authoritarian regimes. The "Memory, History and Loss" exhibition which was formally opened by SfU President, Dr. Michael Stevenson, centred around eight paintings that were donated by the artist to the University. These and other works by Hodnett are on permanent display at SFU's Burnaby campus. Click here to read Dr. Stevenson's opening speech. SFU purchased a major work entitled "C.I.T.E.S. Scapegoat" for their permanent collection in 2008. Hodnett has curated numerous exhibitions since 1975 and has been selected to judge various national and international art competitions in both South Africa and Canada. He worked with author and poet Tom McGauley, editor Michael Barnholden and The Art Emporium on a book on Canadian painter Jack Shadbolt . since his arrival in Vancouver, Noel Hodnett has actively supported the Canadian Foundation for Trauma Research, UNICEF's Unite with Art and Arts Umbrella's annual SPLASH event by donating major works to their respective annual charity auctions. The artist is the subject of a 12 minute documentary film (2001) by Swiss film maker Verena Endtner entitled "Noel Hodnett - Portrait of a Painter" . "Hodnett shocks and repels, yet one is drawn back time and time again to be seduced and energized by the sheer beauty of paint application, the mastery of space articulation, the exploitation of the expressive aspects of visual experience and artifice." - Marilyn Martin - Director, South African National Gallery. "The work is sensuous and expressionistic, and has much in common with contemporary British painting in its exaltation of paint." - E.M. - The Art Newspaper , United Kingdom. "Noel Hodnett's painting practice is arguably the most diverse and prolific of any Vancouver painter. His depictions are dense, layered, and achieve what the American poet Lorine Niedecker termed the state of being 'a condensery'." - Bill Jeffries - Director/Curator, Simon Fraser University Art Galleries, Vancouver, Canada. "There is a message in Hodnett’s paintings to be noticed; it refuses to be ignored, and deserves to be contemplated." - Megan Lau - Art Critic, SFU Student Newspaper. "As an artist of undisputed technical acumen, Hodnett's paintings are painted with apparent abandon despite the formality of their underlying structure." - Hazel Friedman - Art Critic - The Star. "His paintings are so large and epic in nature that they seem to explode in the confines of the galleries" - Mia Johnson - Preview - The Gallery Guide. © Copyright Noel Hodnett - 2018- All rights reserved.